The cellular environment where tumor cells reside is called the tumor microenvironment (TME), which consists of borders, blood vessels, lymph vessels, extracellular matrix (ECM), stromal cells, immune/inflammatory cells, secreted proteins, RNAs and small organelles. By dynamically interacting with tumor cells, stromal cells participate in all stages of tumor initiation, progression, metastasis, recurrence and drug response, and consequently, affect the fate of patients. During the processes of tumor evolution and metastasis initiation, stromal cells in TME also experience some changes and play roles in both the suppression and promotion of metastasis, while the overall function of stromal cells is beneficial for cancer cell survival and movement. In this review, we examine the effects of stromal cells in TME on metastasis initiation, including angiogenesis, epithelial-mesenchymal transition (EMT) and invasion. We also highlight functions of proteins, RNAs and small organelles secreted by stromal cells in their influences on multiple stages of tumor metastasis. Tumor mass is very heterogeneous and resembles a complicated organ more than a simple accumulation of cells. The environment in which the tumor exists is called the tumor microenvironment (TME) and is composed of blood vessels, lymph vessels, ECM, stromal cells, immune/inflammatory cells, secreted proteins, RNAs and small organelles (Figure 1A) . TME plays indispensable roles in tumor initiation, progression, metastasis, recurrence, and drug resistance. Metastasis can be separated into processes of initiation, progression and virulence according to the categories of metastatic genes. Initiation of metastasis mainly includes the processes that occur in preparation for malignant cells to invade and circulate into vessels in TME. Those processes are angiogenesis, epithelial-mesenchymal transformation (EMT) and invasion/intravasation . Angiogenesis is essential for tumor and stromal cells to absorb nutrients and exchange air, and it provides a tunnel for cells to move . Through EMT, tumor cells ordinarily become more stem-like, aggressive, invasive and have stronger resistance to multiple chemical therapies . Invasion enables tumor cells to intravasate into the circulatory system and makes it possible to colonize at distant location after circulation . The process of intravasation is essential for tumor cells to become circulating . In this article, we review the effects of stromal cells in TME on metastasis initiation. In a tumor, non-transformed cells, which include fibroblasts, mesenchymal stem cells, macrophages, lymphocytes, endothelial cells, and pericytes, participate in tumor progression and regression . The targets that those cells have effects on and the mechanisms they are functioning through are summarized in table 1. Fibroblasts are the predominant cell type in TME and are associated with all stages of the cancer. These activated fibroblasts in tumors are called myo-fibroblasts or Cancer-Associated-Fibroblasts (CAFs). CAFs enhance tumorigenesis, angiogenesis and metastasis by secreting growth factors and cytokines and promoting TME remodeling through the secretion of Matrix Metalloproteinases (MMPs), ECM components and other enzymes (Table 1) . For immune activity, CAFs suppress the activity of cytotoxic T lymphocytes and recruit lymphocytes that produce inflammatory signals to promote cancer progression (Table 1). It has been reported that CAFs can reconstitute anti-metastatic TME into a pro-metastatic TME . This might be due to the function of stroma derived factors. Fibrinogen-like protein 2 in TME activates CAFs and causes them to become pro-tumorigenic, which promotes the accumulation of myeloid-derived suppressor cells (MDSCs) through the secretion of CXCL12. This then affects tumorigenesis and cancer progression . Additionally, CAFs facilitate resistance of anti-cancer drugs or therapies and provide protection or pro-proliferation factors in cancer cells (Figure 1B) . Currently, more genes in fibroblasts inside TME have been shown to be potential marks for the cancer progression, like caveolin-1 , which can be developed as therapy targets. The Effects of Stromal Cells on Tumor in TME. Cells and Molecules (Grey) in TME. (A) TME and cells in TME: CAFs, MSCs, TAMs, Lymphocytes, Endothelial cells, Pericytes, Tumor cells in epithelial status and mesenchymal status. (B) The roles of CAFs in TME: Secret cytokines to affect tumor cells' fates; Remodel ECM; Immunosuppression. (C) The roles of MSCs in TME: Differentiate into other cell types; Secrete cytokines or miRNAs directly, or through exosomes; Transfer organelles through nanotubes; Are recruited by tumor cells. (D) The roles of TAMs in TME: Are recruited by other cells; Secrete cytokines or inflammatory signals to affect tumor cells' fate; Remodel ECM; Immunosuppression. (E) ECM in TME: ECM have many molecules and is remodeled by CAFs, MSCs and TAMs, while it affects the fates of tumors through integrins and other molecules. Mesenchymal Stem Cells (MSCs) are a kind of multipotent cell that can differentiate into multiple mesenchymal cell lineages, including multipotent stromal cells or mesenchymal stromal cells . MSCs have been reported to cure injured cells or tissues by differentiating into cells of the same type with injured cells. They interact with tumor cells via the secretion of growth factors or cytokines and by transferring mitochondria or microRNAs through tunneling nanotubes or exosomes (Table 1) . MSCs are tumor tropisms and attract the attention of different groups to explore specific delivery vehicles for tumor therapy [11, 12]. Residing in tumors, MSCs form a fibrovascular network by differentiating into CAFs and vascular pericytes . While the function of MSCs in cancer progression is diverse under different conditions, any changes can switch the functions of MSCs from tumor promotion into suppression (Figure 1C) . Macrophages play important roles in inflammation, immunology, development and wound healing . They can also be recruited to TME by tumor cells or MSCs through the secretion of specific factors, then they become polarized and are referred to as Tumor-Associated Macrophages (TAMs) . TAMs suppress immune activity and promote cancer progression, which is similar to their functions in wound healing (Table 1) . The balance of the inflammation significantly influences the effects TAMs have on tumors . Also, macrophages remodel ECM by organizing ECM and secreting ECM components and enzymes (Figure 1D) . In this article, we focus on three types of stromal cells including CAFs, MSCs and TAMs. Additional types of non-transformed cells in TME are summarized in Table 1. Lymphocytes have paradoxical functions in TME, although T cells and B cells can be found in invasive tumor margins in draining lymphoid organs or lymphoid structures adjacent to TME . Endothelial cells in TME compose vasculatures and lymphatic vessels that branch to the ends of the tumor, which is needed for tumor growth and metastasis . Similarly, pericytes or perivascular stromal cells function in structures in the support of blood vessels (Table 1) . ECM functions as a scaffold for the cells in TME and plays a dynamic role in cancer progression, especially as an essential regulator of invasive processes . ECM is a complicated system of proteins, glycoproteins, proteoglycans and polysaccharides, which contains multiple growth factors and builds a tight interaction with cells in TME . In healthy tissue, ECM plays a tumor suppressing role, while it becomes abnormal in tumors and plays a tumor promoting role . The components functioning in tumor promoting roles in ECM are induced in TME [21, 22] and they influence tumor cells through interacting with integrins (Figure 1E) . Recently, NK cells are reported to control metastasis formation through influencing tumor architecture by regulating the secretion of FN1, an important ECM component . This highlights the function of interactions between stromal cells and ECM in TME. As summarized in table 2, secreted factors in TME function as signals between cells, or tools in ECM remodeling, including cytokines, integrins, proteases and microRNAs . Cytokines are kind of small proteins that have low molecular weights, which mediate the communication between cells . Cytokines in TME, including tumor necrosis factor, interleukins, growth factors and chemokines, regulate the progression of cancer and determine the fate of stromal cells. This is depended on the balance of their pro- and anti-functions in inflammation, proliferation, tumorigenesis, migration and apoptosis (Table 2) . Integrins are integral membrane proteins and a large family of cell surface receptors . Integrins are essential in the signaling and transfer of information between cells or between a cell and the ECM. They are also essential in maintaining cell-matrix adhesions. Irregular cell-cell adhesions, caused by disrupted integrins, are signs of cancer (Table 2). In TME, the expressions of metastasis-promoting integrins are enhanced, while those suppressing proliferation, survival and migration are repressed . Recently, some groups are focusing on exosome derived integrins as the researches on exosome are increasing . Also, integrins are reported to affect internal activities of tumor, like nuclear alteration . Extracellular proteolysis plays an essential role in tissue homeostasis and TME [31, 32]. Among these proteinases that mediate the proteolysis of ECM, matrix metalloproteinases (MMPs) have the closest relationship with cancer progression (Table 2) . It is already known that ECM degradation that is mediated by MMPs promotes the invasion and metastasis of cancer . Furthermore, recent research indicates that MMPs promote tumor growth, angiogenesis and regulate apoptosis and some MMPs function in tumor suppression (Table 2). Thus, MMPs are also a family of proteins with paradoxical role in TME . MicroRNAs are endogenous, small non-coding RNAs, each of which has 18-24 nucleotides. They negatively regulate target mRNAs, post-transcriptionally by disrupting transcription or translation . MicroRNAs participate in several pathways and function in the regulation of different components of TME . Besides microRNA, lncRNA or long non-coding RNA is also a potent participant that is secreted in TME. Some lncRNAs function in the communication between TME and stromal cells, like transforming fibroblasts to be tumor-promoting . The Effects of Secreted Factors on Tumor Cells in TME. Angiogenesis plays an initial role in the process of metastasis, which provides a way for aggressive tumor cells to leave primary tumors and move to distant metastatic sites. In the process of angiogenesis, stromal cells in TME play promoting roles. We introduce these regulatory pathways involving stromal cells in the following section . Stromal cells affect the fate of TME through the secretions of these angiogenesis-promoting factors and angiogenesis-inhibiting factors. Among these factors, VEGF is the most potent. VEGF promotes the migration and proliferation of endothelial cells and the permeability of vessels [39, 40]. In cells, activated Ras and PI3K signal pathways trigger increased transcription of VEGF and other factors that regulate VEGF, like TGF-β, PDGF and bFGF . Thrombospondin-1 (Tsp-1) is a potent endogenous antiangiogenic protein. It functions by binding to CD36 on the surface of endothelial cells and makes them insensitive to VEGF and bFGF. Tsp-1 also inactivates MMP9 through binding; this decreases the release of VEGF and bFGF from ECM. Thus, in aggressive tumors, repression of Tsp-1 is required and common [42-44]. The PI3K-Rho-ROCK-Myc pathway is active in several types of human breast cancer cells and it represses Tsp-1 via phosphorylation. This pathway is called the “angiogenic switch” due to its cell-autonomous character . Some tumor cells could overcome the inhibitory function of Tsp-1 by producing increased levels of VEGF . CAFs are the predominant stromal cells in TME and function as a scaffold along with ECM . ECM secreted by CAFs results in a hypoxic environment inside the tumor. This effect results in the recruitment of TAMs and triggers TAMs and tumor cells to produce more HIF-1α and VEGF . HIF-1α induces tumor and stromal cells to produce more VEGF and other pro-angiogenesis factors. VEGF contributes to the recruitment and activation of endothelial cells . Cytokines secreted by CAFs also contribute to angiogenesis. CXCL12 (Stromal Cell-Derived Factor 1, SDF1), a chemokine secreted by CAFs, promotes angiogenesis through the recruitment of endothelial progenitor cells (EPCs) into TME  and its receptor, CXCR4, has already become a novel target for drug delivery [48, 49]. CAFs also can secrete VEGF directly, as well as other growth factors that promote angiogenesis by inhibiting the angiogenesis-suppressing role of TSP1 . Injection of tumor cells with MSCs into mice produces twice the vessels than injecting tumor cells alone. MSCs promote angiogenesis directly through the secretion of VEGF and indirectly, through the secretion of other growth factors, like TGF-β, to influence the effect of VEGF and the functions of other cells . In a recent clinical therapy, researchers found that radiation therapy stimulates the secretion of inflammatory mediators, like SDF-1α and PDGF-B, from tumor cells. These signals increase the recruitment of MSCs through the binding of CXCR4 or PDGFR-β and enhancement of vasculogenesis by triggering MSCs to differentiate into pericytes . Hypoxia produced by tumors may recruit TAMs to those hypoxic sites, and then induce TAMs to produce HIF1-α and enhance its function on transcription factors. This increases the production of pro-angiogenesis factors like VEGF, basic Fibroblast Growth Factor (bFGF), TNFα, and CXCL12 [3, 38]. Conversely, Colony-Stimulating Factor (CSF) increases the production of metalloelastase via macrophages . Metalloelastase cleaves plasminogen into several small proteins, including the antiangiogenic protein, angiostatin . 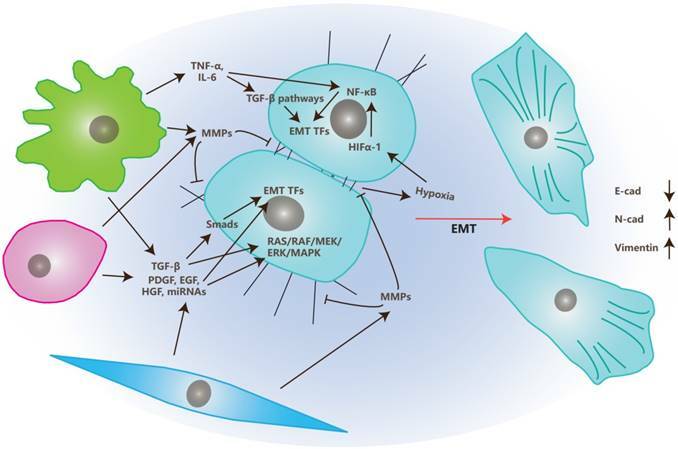 EMT is the transition of tumor cells from epithelial status to mesenchymal status and, therefore, gives migrating and invasive abilities to these tumor cells . 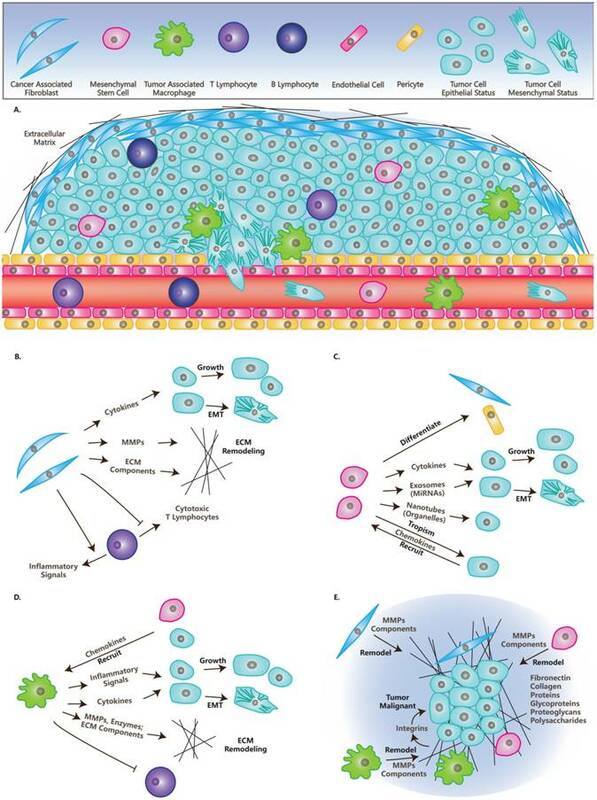 Stromal cells in TME also play crucial roles in EMT, together with multiple factors that are illustrated in Figure 2 and are discussed below. In TME, CAFs, MSCs, and TAMs affect EMT primarily through the secretion of growth factors like TGF-β, PDGF, EGF, VEGF, HGF or MMPs like MMP1, MMP2, and MMP9 [4, 55]. There are several classes of growth factors functioning in the process of EMT. The key regulators among them are TGF-β family members, which may be secreted by stromal cells and tumor cells [56, 57]. TGF-β induces EMT mainly through two pathways: Smads dependent and Smads independent pathways. In the Smads dependent pathway, TGF-β induces phosphorylation and heterodimer formation of Smad2 and Smad3 by binding to membrane-bound TGF-β receptors . The Smad2/Smad3 complex then interacts with Smad4 and is transferred into the nucleus where they induce EMT Transcription Factors (EMT TFs) such as snail, twist, and ZEB . In the Smads independent pathway, TGF-β induces EMT by activating RAS/ERK, JNK, p38 MAPK pathways that are cooperated with integrins or simply through integrin interactions . The Effects of TME on Epithelial-Mesenchymal Transition. In TME, stromal cells, like CAFs, MSCs and TAMs, secrete growth factors like TGF-β, PDGF, EGF and HGF, along with miRNAs like miR21 and miR200 family, to regulate EMT through EMT transcription factors or RAS/RAF/MEK/ERK/MAPK pathway. They also secret MMPs to degrade ECM and junctions between cells and cells with ECM to “free” tumor cells. Inflammatory signals secreted by TAMs, like TNF-α and IL-6, trigger EMT through TGF-β or NF-κB pathways. Meanwhile, hypoxia produced in TME up-regulate HIFα-1 and trigger EMT through the NF-κB pathway. Growth factors besides TGF-β (like EGF, FGF, HGF, VEGF and PDGF), also induce EMT via the induction of EMT TFs and activation of the RAS/RAF/MEK/ERK/MAPK pathway . Matrix metalloproteinases (MMPs) also play important roles in the process of EMT. MMPs can degrade cell-matrix adhesions as well as cell-cell junctions that assist the morphological transition from epithelial to mesenchymal. MMPs also release EMT regulators by degrading ECM into TME . Besides secreting growth factors and MMPs, TAMs also participate in this process through the secretion of inflammatory factors like TNF-α and IL-6 [60-62]. Those inflammatory factors trigger EMT by inducing TGF-β or NF-κB pathways. Additionally, TNF-α also induce EMT through the triggering of ROS. IL-6 does it by activating the JAK/STAT3 pathway [63, 64]. While, enhanced expression levels of COX2 in TAM is positively correlated to the secretion of COX2, IL-6, PGE2 and MMP9, and promotes the process of EMT of breast cancer cells by activating the Akt pathway . Recently, Cédric Blanpain reported that tumor cells in the EMT process show progressive states from epitheial to mesenchymal . Further, they determined the microenvironmental changes company with the progressing EMT states. They also found that the number and density of endothelial cells and lymphatic cells (especially macrophages) were increased in the progressing of EMT process. This suggests interactions between blood vessel formation and inflammatory with EMT . Stromal cells also can release MicroRNAs like miR21 and miR200 family members through exosomes to communicate with cancer cells and induce EMT [67-69]. Invasion is a process in which tumor cells migrate from one place to another by breaking the ECM or basement membrane . For example, the migration of tumor cells from primary tumors into sites near vessels is a typical invasion . In the process of invasion, MMPs are secreted by stromal cells or tumor cells and degrade the ECM and basement membrane in the path of tumor cell migration. MMPs also regulate the skeleton of tumor cells that is related to cell motility and invasion . Conversely, intravasation is the process by which tumor cells migrate into blood or lymph vessels through Trans-Endothelial Migration (TEM). There are two kinds of intravasation: paracellular and transcellular. Most tumor cells undergo paracellular intravasation. 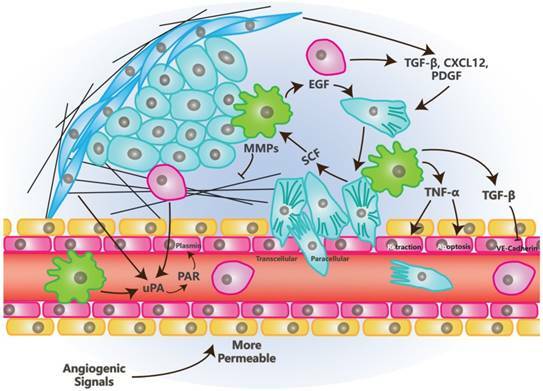 In the process of paracellular TEM (Figure 3), tumor cells migrate across the vessel walls composed of endothelial cells by opening the junctions between endothelial cells. In this process, endothelial cells undergoing retraction to make space for tumor cells . In transcellular intravasation, tumor cells migrate into the vessels directly across the body of endothelial cells. Endothelial cells undergo degradation of skeletons and contraction in this process . The Effects of TME on Intravasation. Tumor cells in mesenchymal status is leaded by Vessel Associated/Tumor Associated Macrophages and invade toward the vessel wall, tumor cells in turn, recruit macrophages. Growth factors, chemokines, proteases and inflammatory factors that are secreted by stromal or tumor cells, promote the opening of junctions between endothelial cells. Factors promoting angiogenesis enhance intravasation due to the loose junction between endothelial cells and low coverage of pericytes in newly formed blood vessels. There are also multiple stromal cells and factors that function in the process of intravasation in TME [5, 74]. Besides endothelial cells, Vessel Associated Macrophages (VAMs) or Tumor Associated Macrophages (TAMs) are crucial to this process. VAMs attract tumor cells to invade toward vessels through the secretion of EGF, meanwhile, tumor cells secret SCF to recruit macrophages. These processes build EGF/SCF paracrine interaction which depends on the contact with each other . TNF-α, which is secreted by macrophages, may trigger the retraction of endothelial cells by binding to its receptors while it also can make vessels more permeable for tumor cells by inducing an apoptosis signal, along with other apoptotic ligands . Other stromal cells like MSCs and CAFs regulate the process of intravasation through the secretion of TGF-β, PDGF, CXCL12/CXCR4 and MMPs . TGF-β promotes EMT and invasion  while plays a paradoxical role in intravasation. Long-term exposure of TGF-β promotes the proliferation of endothelial cells and inhibits the crossing of tumor cells into vessels. Transient signals induced by TGF-β promote intravasation through the down-regulation of CSF1, LHX2/PDGFβ and Twist [5, 77, 78]. Similarly to VEGF, TGF-β also promotes the opening of junctions between endothelial cells by inhibiting the complex of VE-Cadherin and β-catenin . Besides TGF-β itself, Latent TGF-β Binding Protein 3 (LTBP3) promotes the formation of intravasation involved angiogenesis  and suggests that more investigation on this factor is needed. Urokinase-type Plasminogen Activator (uPA) is the soluble portion of the protease system named uPA/PAR. This soluble portion can be secreted by CAFs, MSCs and macrophages [80-82]. Its function depends on its binding to the PAR receptor and this binding is promoted by MMP1. After uPA/PAR binding, these proteins may cleave plasminogen into plasmin, which cleaves CDCP1. Cleaved CDCP1 promotes the intravasation via the FAK/PI3K pathway that cooperates with β1-integrin [5, 83]. Angiogenesis is highly related to the process of intravasation. Those angiogenic stimulators, like VEGF, bFGF and PDGF, promote intravasation by promoting angiogenesis to provide larger and more permeable vessels. These factors also promote the invasion of tumor cells toward vessels [74, 77]. There are also several microRNAs that facilitate intravasation of breast cancer cells, like miR10b and miR200c [84, 85]. Stromal cells are indispensable in tumors and TME. They are recruited by tumor cells and affect metastasis initiation through the regulation of tumor cells and themselves. In TME, CAFs mainly play promoting roles in metastasis initiation (Table 1). This might be due to its functions in immune suppression, ECM remodeling and the secretion of pro-inflammatory and pro-metastatic cytokines, enzymes and microRNAs . MSCs in TME affect metastasis initiation by differentiating into other stromal cells or secreting multiple factors. Currently, many labs are focused on “cell therapy”, based on the research on MSCs. TAMs are also potent stromal cells in TME. In metastasis initiation, they function with at least three major features. First, they secret inflammatory signals like TNF-α and IL-6, then activate angiogenic or EMT-promoting pathways. A recent report showed that COX2 in TAMs is essential to their function with this feature . Second, they regulate the process of intravasation by forming EGF/SCF paracrine interaction with tumor cells. Third, TAMs also secret multiple kinds of cytokines like IGF . Other than those three types, TAMs also transfer iron to tumor and promote tumor cell proliferation , which open a new door for research on TAMs. Other than these types of stromal cells, there are still several types of non-transformed cells in TME like osteoblasts and osteoclasts in bone metastasis , platelets and monocytes in angiogenesis and tumor progression [89, 90], and neutrophils in metastatic tumors . The participation of stromal cells in TME not only gives researchers more targets and avenues, but also results in more uncontrolled factors in cancer research. Recently, a group put forward a method that defined the sites of metastatic tumor microenvironment by staining three parts: migrative cancer cells, TAMs and endothelial cells . They named these sites TMEM (Tumor Microenvironment of Metastasis) and found the number and status of these sites correlate with the metastasis of the tumor. Furthermore, they explored that TMEM mediated neoadjuvant chemotherapy induced the metastasis of breast cancer , which is crucial in the clinical application and still a hot-point in current drug development . Exosomes in TME have been showed to participate in multiple stages of cancer progression, including metastasis initiation . They are good mediators of information transfer between cells and their cargos include miRNAs, mRNAs, DNAs and proteins . Exosomes could also be released by stromal cells and participate in the regulation of cancer progression, especially those from MSCs [97-99]. Stromal cells also undergo metabolic changes in TME, which contributes to the fates of tumor cells. Reports have shown that TAMs and CAFs undergo metabolic reprograming of glucose, lipids and amino acids in TME [100, 101]. While, tumor cells probably enhance the aerobic glycolysis of TAMs and CAFs and contribute to their activation [102, 103], and these stromal cells should reshape the metabolism of TME and convert nutrients into forms that are absorbable for tumor cells . Metabolism also changes the pH value in TME. One group showed that acidification of extracellular fluids promotes the activation of CAF from MSC . It would be a future aspect to explore whether and how metabolism functions in the metastasis of tumor cells in TME. Currently, stromal cells could also be used in combining therapies with immune therapy. Firstly, immune therapy modifies TME to enrich preferred phenotypes and increase immune effector cells, while decreasing immune suppressive cells. Secondly, immune therapy activates, triggers and regulates stromal cells, while stromal cells release chemokines or other factors to recruit or regulate immune cells [105, 106]. These processes are all potential targets in the future combination of therapies. We thank the members of the Deng laboratory for critical discussions. This work is supported by the Chair Professor Grant (CPG2017-00026-FHS), MYRG2016-00132-FHS and MYRG2016-00139 of University of Macau and FDCT grants (065/2015/A2 and 094/2015/A3) to Chu-Xia Deng. The authors declare no conflict of interest.